EGOL, someone I highly respect at Cre8asite Forums posted a thread about his recent fear or anxiety around accepting guests posts, despite the quality of it, due to Google's Penguin update. He said that he heard that accepting articles with credit links at the bottom would get him in trouble with the Google Penguin update. Honestly, I thought Penguin was mostly about external incoming links, not internal links. 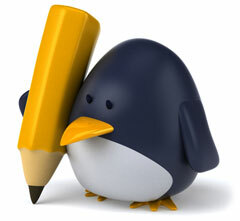 Since Penguin, I am getting a flood of article offers. Most of this content is crap. Some of it is "average" quality (which I don't publish). Some can be excellent, unique, highly desirable. So now I am deciding if I want to accept some of this content, knowing that I could be publishing links to sites that could have past, present or future manipulation. I have a potential article that I really like and that would be very popular with my visitors. The author's site ranks #1 in a difficult niche and they don't have enough content on their site to hold that position from editorial links (IMO). I have not seen any articles or discussion about the cautions that a publisher should be following in these days of post-penguin linking. Do you think EGOL and other publishers need to worry? There are tons and tons of quality sites that accept guest posts and give credit to the author through a link to their web site.